LP with CD 400 numbered / heavy sleeve / 180 gram transparent GREEN vinyl / 2 page insert with liner notes + photos / CD with cover included CEMENT is from the island of Gotland, 320 km east of Sweden's mainland. This island has always been different from the rest of Sweden in many ways, with their own strong dialect and mythology. It�s a myth about Gotland before Christianization and dates back to 1350 AD. According to it Gotland was under water during day time and only surfaced during the night because of a mysterious spell cast upon the island. 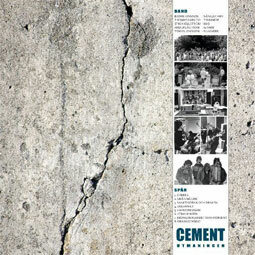 Cement was formed during the autumn of 1973 inspired by the aforementioned acts with two guitar players (Björn Jonsson, Anders Åström) and two drummers (Ulf Abrahamsson, Thomas Harlevi) and influenced by such bands as Mountain, Grand Funk Railroad and of course the Swedish power trio November. The recording of this album was done in 1977 and released only as a limited run of 100 cassette tapes. This is the first ever LP release of the album. Instrumentally, ”Cement - Utmaningen” is a tour de force, every bit as excellent as any of the better known heavy rock album from the Swedish 70's. As far as the songs go, there's not one single weak track on this album so the album is a true masterpiece. Heavy dual guitars, great songs, fantastic production and powerful bass, vocals and amazing drums. Way better than most known albums we have heard from Scandinavia. One of the best Swedish underground heavy rock LP's. Collectors edition colored vinyl with CD.